1) Using a level, place the top track at the desired height and mark each hole with a pencil. 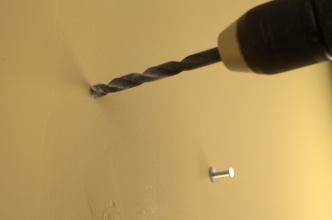 2) Using a 1/8” drill bit, drill a pilot hole. If you hit wood, continue. 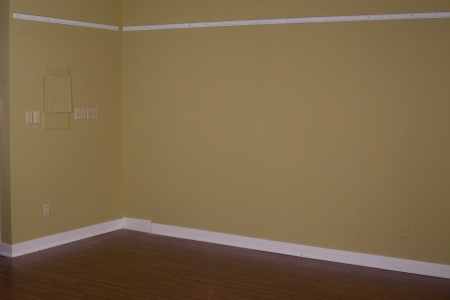 If there is a hollow area behind the wall, enlarge the hole with a 3/8” drill bit and insert the drywall anchors provided. 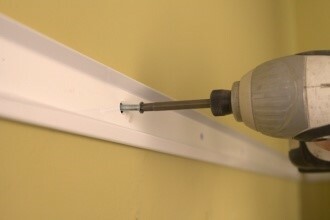 3) Once all the holes are drilled and the anchors are inserted (where necessary), place the top track on the wall. Insert and tighten all of the screws. 4) Insert all of the hanging standards on the top track and slide them to their position as per your design. 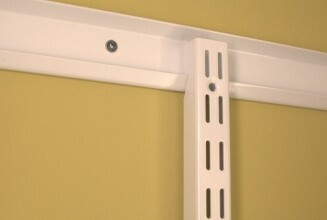 5) Insert the shelf brackets at the desired height by tilting them up as you insert them in the hanging standards. 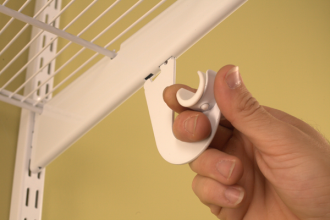 6) Insert the shelf onto the bracket with the last wire sitting in the notched holes of the bracket. 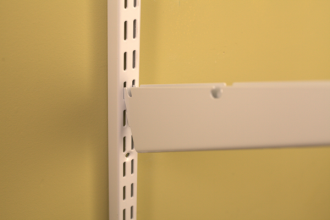 7) To lock the shelf into place, press the middle part of the shelf down, insert into the bracket slots, then push towards the back wall. Repeat for all brackets. 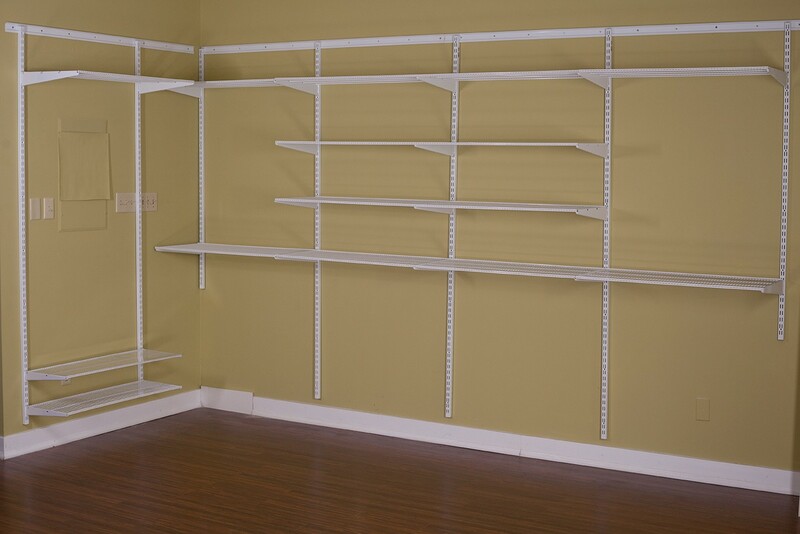 To remove shelf, lift at back and pull out from the wall. 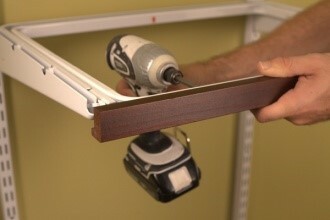 9) Once the front attachment is inserted, swing the back attachment up into the bracket. 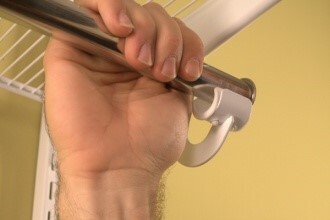 10) The rod snaps into the rod holder by firmly pulling down. 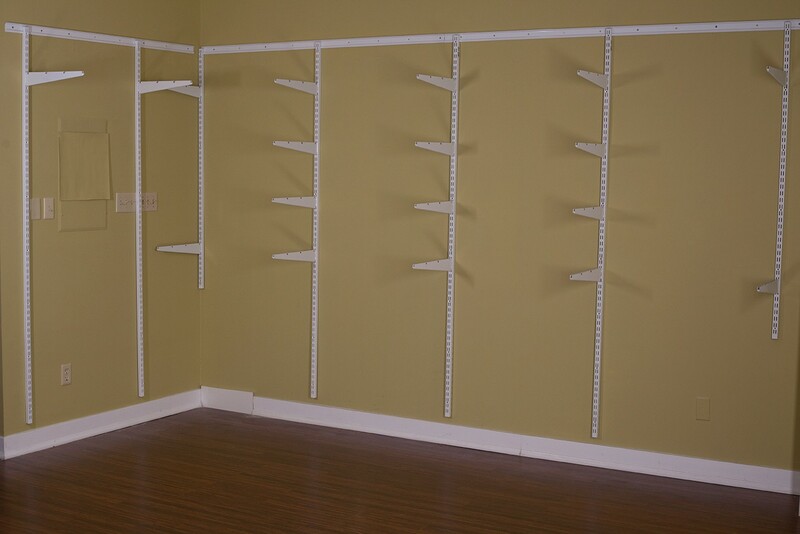 11) For Baskets/Pull-Out Shoe Racks. 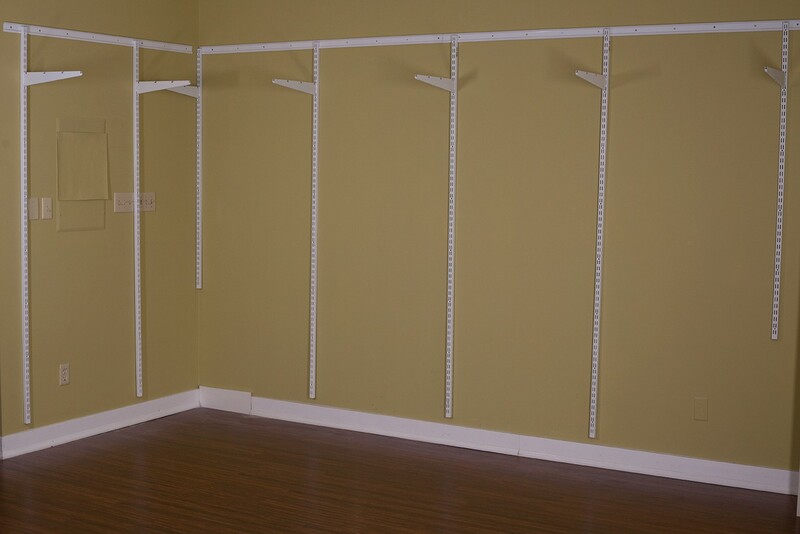 Place the 16” bracket at the desired height. See #5. Position the sliding frame notches into the bracket grooves. 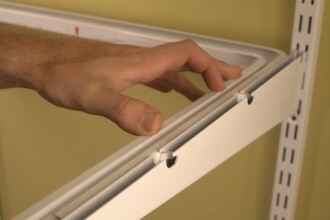 12) Push down and back towards the wall until they lock. 13) Wood Fascia for Shelves (if purchased). 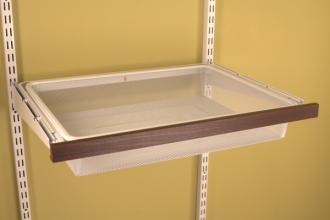 Insert front lip of shelf into fascia. 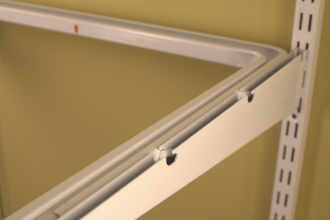 Secure with hardware provided. 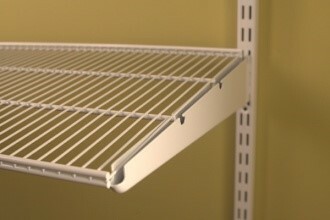 14) Basket Frame Fascia (if purchased). 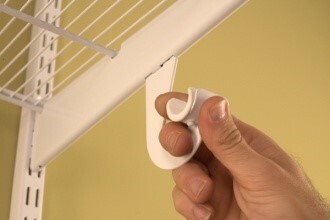 Centre the basket frame fascia with the lip down and attach with ¾” wood screws through frame holes. A printable copy of these instructions can be downloaded here. 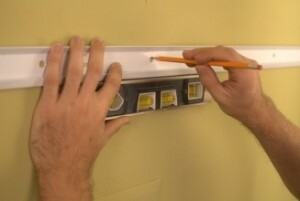 Having an installation a problem? Talk to us. 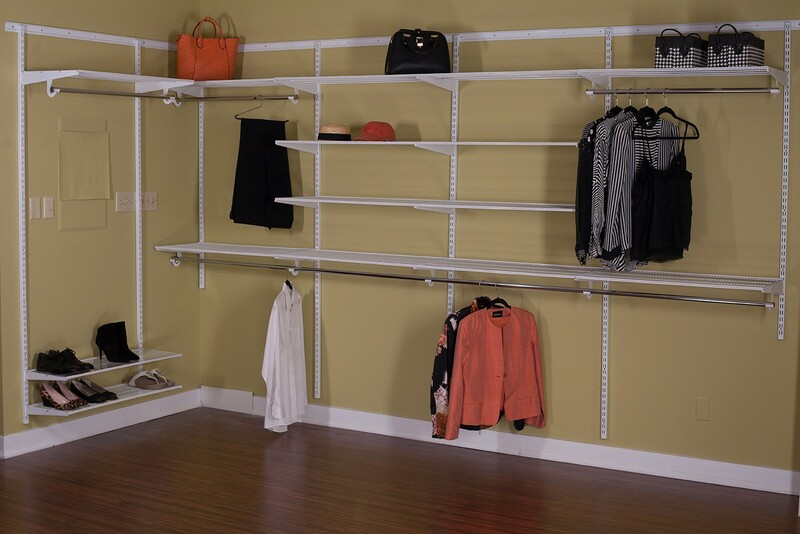 We can do it for you for an additional fee.